This is one case for the 3-3 point pincers where there is some actual theory to report. 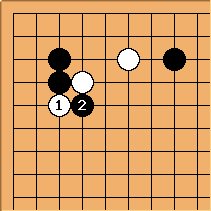 After , White usually plays at a to make shape. 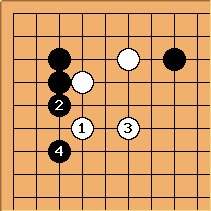 It is also known for White to play a counter-pincer at b. 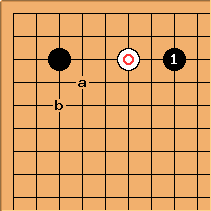 This therefore is the position anticipated by Black's pincer. We can note a transposition here from the 3-4 point distant low approach, one-space low pincer. Here though might be a little submissive: the replies at a or b are normal for Black here. 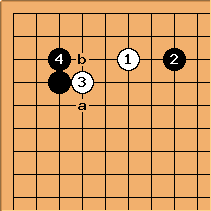 In this line White makes shape in return for giving Black territory. 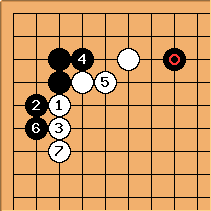 If is hane here instead, Black can cut, leading to what is an unexplored fight, with joseki still being explored. Black can also simply accept a low position with . This result is also seen on the 3-4 point distant low approach, one-space low pincer page. Naturally Black hopes to settle in this position, so that White's influence will not be easy to use effectively.